31 x 31 mm stainless steel case with domed sapphire crystal and closed case back, 7.5 mm thick, sapphire crystal, silver dial with galvanized silver with guilloches and set with 12 diamonds (approx. 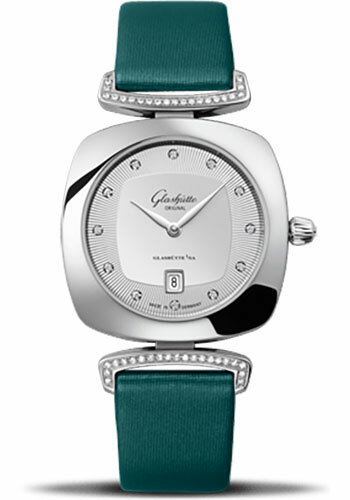 0.06 ct, TW vvs), settings and date window lined with nickel, feuille hands rhodium-plated , Calibre 03-01 quartz movement, teal satin strap with links decorated with 42 diamonds (approx. 0.14 ct, TW vvs), pin buckle with stainless steel. Water resistant to 5 bar. 31 x 31 mm stainless steel case with domed sapphire crystal and closed case back, 7.5 mm thick, sapphire crystal, silver dial with galvanized silver with guilloches and set with 12 diamonds (approx. 0.06 ct, TW vvs), cabochon appliques and date window lined with nickel, feuille hands rhodium-plated , Calibre 03-01 quartz movement, metal bracelet, folding buckle with stainless steel. Water resistant to 5 bar. 31 x 31 mm stainless steel case with domed sapphire crystal and closed case back, 7.5 mm thick, sapphire crystal, silver dial with galvanized silver with guilloches, cabochon appliques and date window lined with nickel, feuille hands rhodium-plated , Calibre 03-01 quartz movement, violet satin strap, pin buckle with stainless steel. Water resistant to 5 bar. 31 x 31 mm stainless steel case with domed sapphire crystal and closed case back, 7.5 mm thick, sapphire crystal, silver dial with galvanized silver with guilloches, cabochon appliques and date window lined with nickel, feuille hands rhodium-plated , Calibre 03-01 quartz movement, metal bracelet, folding buckle with stainless steel. Water resistant to 5 bar.